Some of the most knowledgeable resources on pediatric health, practical parenting and child development from around the world have gathered to create The Triumphant Child: A Practical Guide for Raising Two, Three and Four Year Olds. This book is a fresh new approach to parenting based on traditional principles. It is a must-have for all moms, dads and grandparents as they go about their role of raising their young children. Dr. Olson Huff, M.D. believes that parents want the very best for their children and seek in every way possible the guidance and support necessary to achieve it. This is why Dr. Huff and his daughter-in-law, Nicole Rawson-Huff have compiled and edited these useful and accurate facts and gems of information for raising two, three and four year olds. 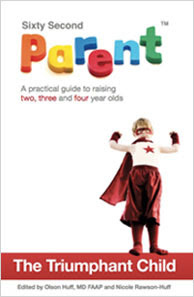 These gems are further supported by parent stories and practical parenting tips throughout the book. Child development specialist, Nicole Rawson-Huff, explains that 'a triumphant child is resilient, confident, self aware, knows their boundaries and shows concern for others'. What is a Triumphant Child? * Is motivated to communicate their ideas, feelings and stories in a variety of ways. What does parenting a triumphant child mean? * Creating a loving, positive environment – loving and believing in your child, yourself and your family unconditionally. * Letting your child make mistakes, but supporting them when they need help. * Being caring and empathetic towards your child and others. * Enjoys and makes the most of their time with their children. * Fosters their child’s self-esteem by giving them developmentally appropriate responsibilities. * Listen actively and communicate effectively with your child. * Discipline their children in a way that fosters self-discipline and self-esteem. * Helping children to set realistic goals and have realistic expectations. * Having the wisdom to create developmentally appropriate boundaries. My kids are way older than this book is specified for, but even so, it still helped. I just wish I had had access to it back then! I've taken parenting classes previously and would recommend them to anyone. The same principles taught in those classes are outlined here in this book: How to teach and treat your children so that they will have high self-esteem and a high value of self-worth. How to be sympathetic towards others. How to be independent. We as parents want all of the above for our children, and more. And rightly so. What good is it to teach them everything except how to get out when they are old enough to? Okay... I'm kidding! Seriously, some children are just not wired the same as others and you will find yourself having to try new and creative ways with them. For example, my son is going to be 13 next month. He's independent, secure in himself, and he knows that he can come to me at any time with anything. My daughter just turned 10. She has ADHD. There's something in her, that no matter what, she's always unsure and needs reassurance. If I'm going to run out to the store for a minute, she'll say "Are you coming back?" and I have to say to her, "Yes, dear, I live here and I love you and I will be right back." She also needs more attention, such as telling her she's beautiful, smart, etc., because things don't come as easy for her as they do to most other people, including her brother. My son, on the other hand, he gets his affection from me, and he knows that I love him, and I tell him how smart, handsome, etc. he is, but he does not need it as much as my daughter does. Even though my kids are older, I still learned a few tips for raising them, especially with my daughter, because sometimes she doesn't act like she's 10. This book is a must read for anyone with children under 5, especially new parents! Thanks to TwitterMoms and Sixty Second Parent for this review! Hello - visiting from SITS. Hope you have a great weekend.